Commercial waste dumped out of public view in remote areas of the country. Hidden litter hotspots around Scotland's coastline have been unveiled in new aerial photographs. 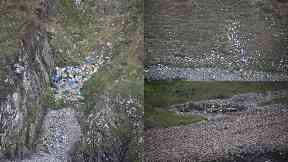 Taken by pilot crews, the images have identified pockets of mainly commercial waste in remote areas out of public view. A map and photographs have been published online by the SCRAPbook (Scottish Coastal Rubbish Aerial Photography) project, a collaboration of three charities - the Marine Conservation Society (MCS), Sky Watch Civil Air Patrol and the Moray Firth Partnership - that aims to help volunteers target their beach clean-ups. Launched in April, Sky Watch pilots have flown over sections of Scotland's coast for the last few months taking pictures when they see litter. Archie Liggat, Sky Watch chairman, said: "In the worst areas it is absolutely at industrial levels, with plastic blasted up the hills from the coast where it's been blown. "There are hundreds and hundreds of large plastic barrels and crates all over the place, and when there is any large plastic litter visible at all there's usually a significant amount of smaller stuff too." Richard Harrington from MCS said there is still a lot of coastline to be covered but it was clear there are large areas of waste "people simply aren't seeing". He said: "It's largely hidden from view, but there are huge volumes of material in some of the most remote coves and on inaccessible beaches that will be a real challenge to move." Mr Harrington said: "If there are people who can get to some of the beaches that have been pinpointed by these photographs, that would be great." Vicky Junik from the Moray Firth Partnership added: "The easier it is to find out where the litter is, the easier it is to mobilise clean up efforts, and we've tried to focus on the less popular or harder to reach parts of the coastline, so we can build a really comprehensive picture of the reality and scale of the challenge - a challenge everyone can help tackle."